My tomatoes aren't as bad as that sad, sad basil I showed you, but they don't look as good as yours, either. Growing tomatoes in FL is hard, though--maybe now that I'm above the frostline I'll more success. At last? Gee, that seems late to me. But my sad news is that my six plants are No Longer Producing! We gorged on maters for two solid months, and now it looks like it's over. Yum...what are you going to make with them? Good Morning and Congratulations, DD! Glad to hear the new computer is up and running! The tomatoes are delicious and beautiful! Thank you! Hmmmm. I always thought Florida was a big tomato producer. What makes it hard to grow them there? Maybe try another variety? I know that I always have good luck with the smaller tomatoes, as they (obviously) take less time to mature, which means less time for things to go wrong! : ) Plus you get ripe tomatoes earlier! 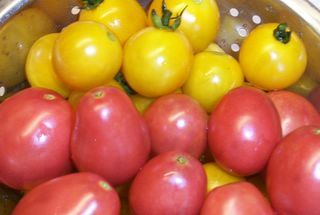 The tomatoes in this photo are Gold Nugget and Thai Pink Egg. Both are little tomatoes. I ordered the seeds from a wonderful, rapidly-growing company here in Missouri called Baker Creek Heirloom Seeds. They sell all kinds of amazing heirlooms. Yes, this is very late for my tomatoes. I have been craving them for ages! I started my seeds late and have pretty much been behind in the garden ever since. But I am sure enjoying the tomatoes now--perhaps even more since I've had to wait so long. Bummer that your plants are done for the season. Are they determinate varieties? It might be harder to grow indeterminates in pots, but you would probably get a longer harvest. Just a thought. . .
Oh, I used these tomatoes to make one of my favorite summer dishes--just the simplest Greek-style salad: halved tomatoes, diced lemon cucumber, lots of chopped fresh basil, little bit of fresh oregano, crumbled feta cheese, and a splash of extra-virgin olive oil and white balsamic vinegar. Salt and pepper to taste and you are set! It was divine. Thank you. It's about time! (ha, for the tomatoes and the computer!) So glad you're enjoying your patio garden tomatoes, too. It was so delicious I made it again last night! : ) I have a hunk of nice blue cheese in the fridge that has been calling out to me. I think I might crumble some of it over the tomatoes instead of the feta next time.